Okay, before we go any further, let me say that I think we can take it on faith that no one ever says to themselves, “I think that I will get a puppy or a dog, and then do everything that I can to play with his emotions, confuse him, make him miserable, and break his spirit.” The fact is, though, that I see people doing just that practically every day. They don’t mean to, but they do. Also, in the spirit of full disclosure, I am going to admit to you that I have been guilty of doing more than one of the soul-crushing things on the list that follows. I’ll let you know which ones as we progress. These are the things that you can do that will break your dog’s heart and undermine the relationship that you have with him. At some point, there’s a pretty good chance that you will do one or more of them, perhaps out of frustration, panic, or simple carelessness. However, forewarned, as they say, is forearmed. So here are the 15 things you should never do to your dog. Remember when you were a kid, and your Mom or Dad would tell you to do something, and you’d ask “Why?” and then you’d get the response, “Because I say so”? How did that work out for you? Did you feel motivated, or resentful? Probably your dog isn’t going to feel resentful if you ask him to do something – it’s just not in his nature. But by the same token, he’s probably not going to feel overly motivated to do what you want if it’s only ever about doing what you want. I’m a big believer in rewarding dogs for good behavior. If he comes when you call him, give him a treat. If he gets into the bath without having to be coerced, tell him what a wonderful, amazing boy he is, and give him a treat! If he waits to eat until you put his dish on the floor and give him permission, praise him. If he stops barking when you tell him to be quiet, give him a tummy rub. You get the idea. In addition to “Because I say so,” Mom probably also hauled out gems like “You get more flies with honey than you do with vinegar.” Why you’d want to attract flies is, of course, beyond me and any other reasonable person, but the meaning is clear – if you want something, you’re more likely to get it if there’s a fair exchange. So don’t expect your dog to do everything you want with no hope of ever being rewarded. It’s just not fair. I know, you’re thinking I’ve lost my mind. Why would I even suggest that anyone would punish a dog for good behavior? And yet, I’ve done it. When Leroy was about six months old, he busted out the front door as I was taking a UPS delivery. I called him and called him, and he flat-out refused to come back. He was far more interested in the butterflies over by the hedge, the neighbor’s lawn sprinkler, and whatever the heck was going on down the rest of the block than he was in responding to my repeated calls for him to come. I chased him all over, shouting, “Leroy, come! Come, Leroy!” At some point, I’m sure he became convinced that his name was “Leroydammit.” And still, he refused to come when called. Finally, he ended up out of sight and I reasoned that the only alternative I had was to call Animal Control to be on the lookout for him, and also to call local radio stations that would broadcast a lost dog alert for me. I also posted on various Facebook groups, and agonized for what seemed like an eternity. A few hours later, finally in response (or maybe not) to my frantic calls of “Leroy, come!” guess who showed up? And what did I do? I told him what a horrible, rotten, awful dog he was and stuck him in his crate. Then I sat down and shook for about half an hour, so relieved that he was finally home. I punished Leroy when I should have praised him. It shouldn’t have mattered that he took forever to obey my command – it should only have mattered that he finally did. Leroy probably figured I was punishing him for coming home. To say the least, my actions were pretty counter-productive. So, if your dog is hesitant to obey, don’t punish. Work harder on training, and reward him when he finally gets it right. To this day I wish I’d greeted Leroy with hugs and cuddles and treats instead of going off the deep end, punishing him, and confusing him. So, when training, offer rewards sometimes, but not always. Think of it the same way you do when you go out for a night at the casino. You’re playing the slots, and you win a couple of times. Next time, you come up with nothing. What keeps you playing? That’s right – it’s the hope that maybe on the next try, you’ll win. You’re kept a bit off-balance. There could be a reward or nothing at all. You’ll make the choice to keep playing, or walk away. Your dog, faced with a similar choice, is almost always going to err on the side of caution. If there’s any chance at all of a reward, he’ll likely do what you want. As to the type of treat you can offer, most dogs love Milk-Bones. You can stock up on the 40-ounce jar now at Amazon for just $8.98 – a $2.13 saving over the list price of $11.11. Janice and Leroy go through tons of Milk-Bones, so I’m stocking up and ordering five jars so that I can get free shipping. Not like I’m going to stop handing out treats, so it just makes sense to save. This has to do with potty training. Believe me: if you make potty time party time, you’ll be sorry. When it’s time to do his business, that should be all that your dog is focused on. It’s not the time to check pee mail, or have a romp in the yard. It’s out, pee, poo, and back in the house. Otherwise, you know what’s going to happen? He’s going to wake you up at all hours of the night, leading you to believe that he has to go potty, when what he really wants to do is go outside and play. You are never going to be able to take the chance that his “Gotta go” routine isn’t for real, and you’ll never get any sleep. To add to the potty training issue, one of the nastiest things you can do to your dog is rub his nose in his urine or feces if he messes in the house. Not only is it cruel, it’s horribly counter-productive. All you’re teaching your dog when you do this is that if you find the mess, he’s going to be punished. He probably won’t even try to tell you he needs to go out next time around, he’ll just find a good place to hide his business. Don’t make a big deal out of potty time. Just take him out and bring him in at regular intervals. Maybe you don’t mind if your dog jumps on you, but other people might not be quite so accepting. It could even have a very bad outcome, like if your dog leaps up on Granny and messes up her hip replacement. 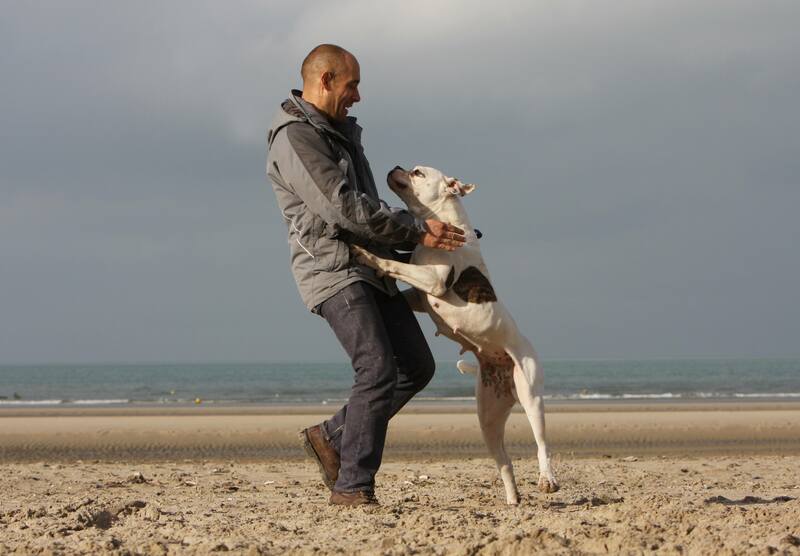 Teaching your dog not to jump on people isn’t just a safety issue, either – if your dog thinks this type of behavior is okay, and other people disagree, you’re setting your dog up for disappointment and confusion when less receptive people shout at him. You don’t want your dog to feel hurt when what he considers to be an act of friendship is met with anger, so work with him and teach him to sit quietly when people visit. Or at least train him to jump up only when given a signal, like a pat on the lap indicating that close contact is welcome. For more detailed information on how to keep your dog from jumping, check out my article, Down Boy! How To Train Your Dog Not to Jump on People. This is another thing that many dog owners do, and it leads to confusion and frustration on the part of the dog. Here’s the thing – dogs will, if not properly trained, pull on the leash. Why do they do that? It’s simple – because pulling on the leash gets them where they want to go. Inconsistent leash training is another mistake I made when I was working with Janice and Leroy. My two are full-size boxers, about 70 pounds each, and as adolescents, they could really give me a workout when we were going on walkies. Sometimes, I just gave in, like “Fine, guys, you want to go over there, then go over there; I don’t have the energy for this.” Other times, I’d yank them back. Big mistake. What they learned from my inclination to take the easy way out was that they only had to walk properly on leash sometimes. Other times, they had to behave. The thing was that they had no way of knowing what I wanted, and when I wanted it, because I wasn’t consistent. That made for two very confused, stressed dogs, and a lot of remedial training – all my fault. Barking should never be ignored, unless it’s the type of barking that should be ignored. Does that make any sense? So, if barking is persistent, that’s the point where you start to ignore it. If you pet the dog to calm him down (which isn’t going to work), talk to him, scream “Quiet!” over and over, or react in any other way, you’re just encouraging the dog to keep on barking. Ignore the barking, and praise him when he finally stops. Some dogs just love to bark. So make sure that you offer a reward when your dog is quiet. If what they get from you is better than the reward they get from barking, you’ll be on your way to correcting the problem. Most of the time, dogs enjoy spending time in their crate. It’s the place where they get their dinner, take a nap, or play with their toys. But if you use the crate as punishment, that’s just wrong. It’s not much different from telling a child, “Go to your room, no phone, no video games, and no TV!” The crate shouldn’t be the equivalent of solitary confinement in prison. If your dog is overly excited and needs a bit of a time out, that’s fine, but locking up a dog in a crate for a long period of time because he’s misbehaved isn’t about correction – it’s about your anger, and it’s wrong. Big dogs like my Janice and Leroy can be notorious “counter surfers.” Counter surfing is simply the act of the dog putting his or her paws up on the countertop, sniffing around in search of whatever you may have left there, and then making off with it. This is a hard habit to break, because the mere act of leaving something on the countertop practically invites the dog to steal it. Then you have a dog doing something that, to his or her way of thinking, demands action, and you get mad at the dog for just being a dog. Last week, in Are You a Dog Person or a People Person, I talked about Janice stealing lasagna. It was my fault she counter surfed, so I laughed it off. But now, I’m more careful about what I leave out. I make sure leftovers are in the fridge, and when I’m cooking, I stay in the kitchen. That way, there’s no stress on my two big counter surfers, who really don’t understand what they’re doing wrong. Someday, I’ll work more on teaching Janice and Leroy to “leave it” even when I’m not in the room, but for now, I’m going to take the easy way out and just not set them up for failure. Here’s another food issue for you. How do you train your dog not to beg at the table? If you have guests who don’t have the same affinity for big brown eyes that you have, it can result in disapproval that you can bet your dog will pick up on and be hurt by. You’re far better off making sure that your dog never gets into the habit of begging than expecting him to understand that it’s okay to take “gifts” from you but not from other people. This doesn’t mean that your dog can never enjoy human food (although there are some foods he should not have – for more information see Your Dog is Not a Human So Don’t Feed Him Like One); it just means that he can’t have it at the dinner table. He can have treats, but only at his usual eating area. No, not your dog – YOU. When you adopted your dog or puppy, you must have known that even the most laid-back breeds need regular exercises. I know that when the weather outside is frightful, the fire is so delightful, to borrow a phrase from a well-known Christmas song. But your dog still needs to be exercised. Cuddles and snuggles are important, for sure, but if you’re not exercising your dog every day, you’re doing him a huge disservice. Dogs also growl when they’re frightened or feel threatened. If you think your dog is growling out of fear, then just remove him from the situation that is causing him discomfort. Don’t punish him for trying to tell you what’s bothering him. You should actually be glad that your dog is growling instead of just going into full-on aggression – if a dog feels threatened and doesn’t growl, then you have no warning that a bite could be about to happen. “Isn’t that adorable,” you say, “He’s protecting his food!” No, it’s not adorable, and some day it’s probably going to get your dog in trouble. Most puppies, at some point, are going to become protective of their food. Cute as the dickens, isn’t it? Until he grows up and becomes an adult dog, with a full set of adult teeth, and he’s still protecting his food. At that point, anyone who comes into your house and makes a move toward the food dish, intentionally or otherwise, is going to get bitten. You need to start early to stop this behavior. As your dog grows up, if you let this go on, he’s not going to understand why, at some point, you decide that it’s not cute any longer and you want him to stop. From the day you bring your puppy home, work on taking his food away from him, putting your hand in his food dish, and generally doing whatever pleases you with his meals. The last thing you need is to have someone insist that you put your dog to sleep because he bit over a food issue. This is actually not something that will cause your dog to feel hurt or confused, so in one sense you probably couldn’t say that it’s harmful. After all, the dog doesn’t know he’s being disrespected. But it’s something that I feel very strongly about, and it’s something that I talked about in Choosing the Right Name for Your Puppy. I absolutely loathe people who hang offensive names on their dogs. When I was researching that article, I discovered that an amazing number of people think it’s just hilarious to give a dog a name like A**hole or S***head. Why do these people even have dogs? Are they so pathetic that the only way they can feel better about themselves is to give an animal a demeaning name? From my perspective, anyone who would do something like that should be required by law to change their name to something like Moron M. McMoron. So, there you have it. 15 things you should never do to your dog. I’ve done some of them, but I’ve learned, and I won’t do them again.